Berkeley Lake is an incorporated place located in Gwinnett County, Georgia. Zip Codes include 30096. Berkeley Lake had a population of 1,695 with 610 housing units; a land area land area of 1.01 sq. miles; a water area of 0.14 sq. miles (12.28% is water); and a population density of 1,682.78 people per sq. mile for Census 2000. Berkeley Lake is a city in Gwinnett County, Georgia, United States. From its 1956 origins as a summer retreat, Berkeley Lake has grown into a thriving community centered on its 77-acre namesake lake. According to the 2000 census, Berkeley Lake is the most affluent community in metro Atlanta and all of Georgia; its 1,695 residents have the highest median household income at $109,401, the highest median number of rooms per house at 8-1/2, and the highest median monthly house payment at $2,152. 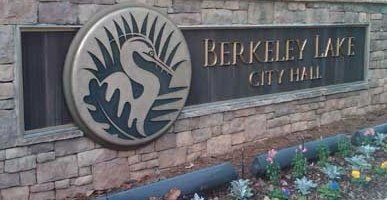 The City of Berkeley Lake is known for being an environmentally progressive city, a bird and wildlife sanctuary, and has been named a “Tree City USA” for the past eight years. Berkeley Lake residents are mostly a mix of entrepreneurs, corporate executives, and other professionals. There is also a large number of artists and writers. Berkeley Lake is located off of Peachtree Industrial Boulevard between Norcross and Duluth. The community consists of several subdivisions around a 77-acre private lake. This entry was posted on Tuesday, December 18th, 2012 at and is filed under 30096-Zip Code, City Of Berkeley Lake, Gwinnett County Community. You can follow any responses to this entry through the RSS 2.0 feed. Both comments and pings are currently closed.